For someone who took early retirement because he was sick and tired of the same routine day after day for 30 years, I manage to fall into “routines” quite easily. After they closed the five-mile trail at Nisqually, my old go-to favorite, I’ve driven to Theler Wetlands once a week when I’m not on out-of-town for nearly seven years now. Once there, I follow the same route I took the first day I visited, even when I’m pretty sure that there won’t be much to see from the boardwalk that reaches out toward the Sound. In recent years I added the marina at Port Orchard to the trip and now I drive there before heading home, even in the summer when I’m pretty sure there’s not going to be much to see. Of course, on Sundays with Leslie I can use Amy’s and on weekdays I can use La Palapas as an excuse for stopping, but I’m pretty sure I would stop even if I wasn’t eating lunch out. Come winter, though, I remember why I always stop at the Marina. Although it lacks the 4 miles or so of walking I love, the birding is often better in an hour than in the entire four hours I spend at Theler. 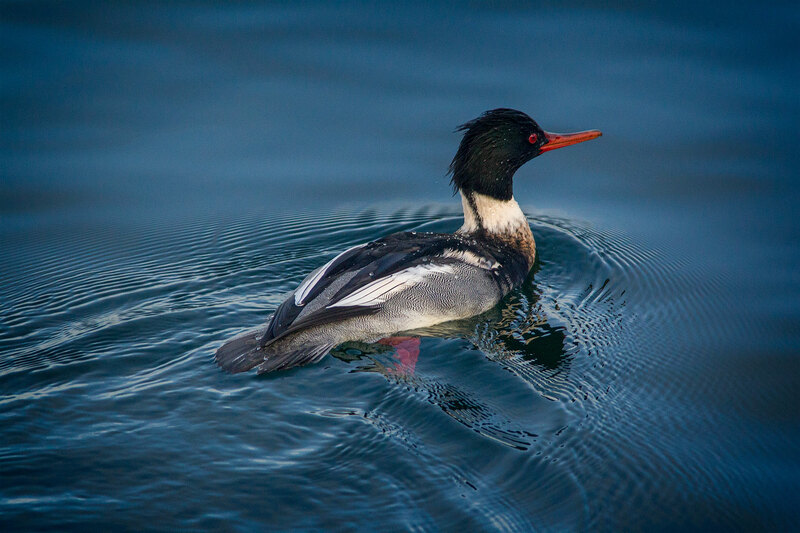 In December I started looking for Red-Breasted Mergansers, particularly males with their brilliant orange beak and black pompadour. The only one I found in December,though, was not in the marina, and I was relegated to taking shots of him looking down from the parking lot, not the best angle. Luckily I know he and his compatriots will be hanging around the marina for the next few months, and I’ll get several more opportunities to improve on this shot. Despite that it was almost always sunny by the time I reached the marina, the rest of my favorite shots from the month could have easily been shot in black and white. 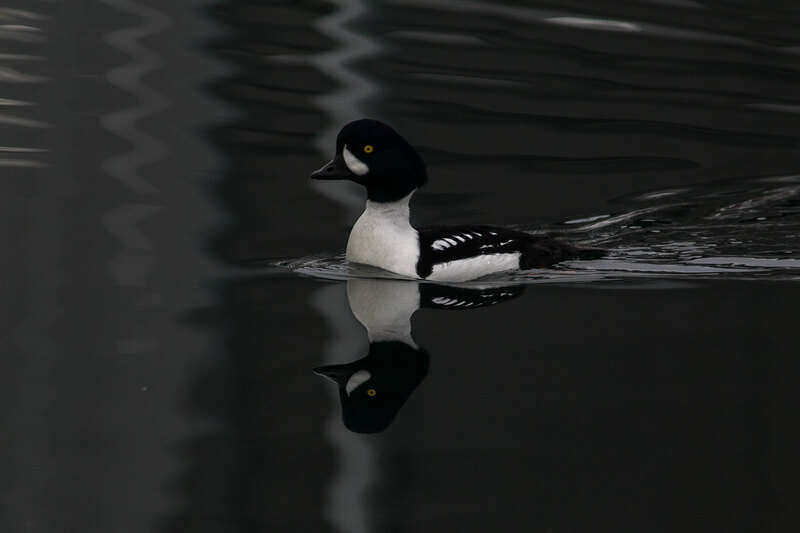 Of course, except for the golden eye, a Barrow’s Goldeneye is pretty much just a black and white duck. Not sure why I like this shot so much, but I do. 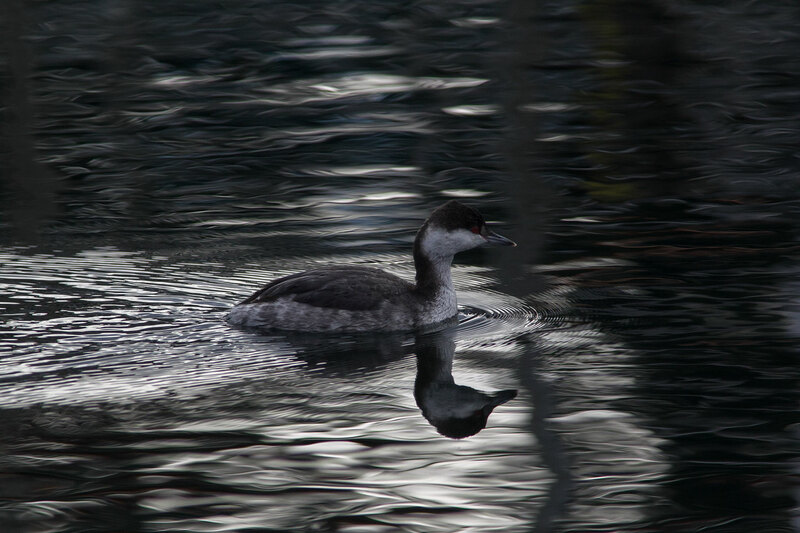 I probably have nearly as many shots of Horned Grebes as I do Great Blue Herons and if I was trying to emphasize its “horns” this would be a terrible shot, but this time of year the reflections in the water might be more fascinating than just another shot of a grebe in non-breeding colors. Luckily not all routines, habits, are bad, and with reinforcement like this it’s easy to see why I fall into them. Hopefully I’ll soon shake this year’s flu-bug and be able to fall back into some old habits real soon.